The Keckley retainerless wafer lug body double disc check valve features a single cast body without pin retainer holes in the body. 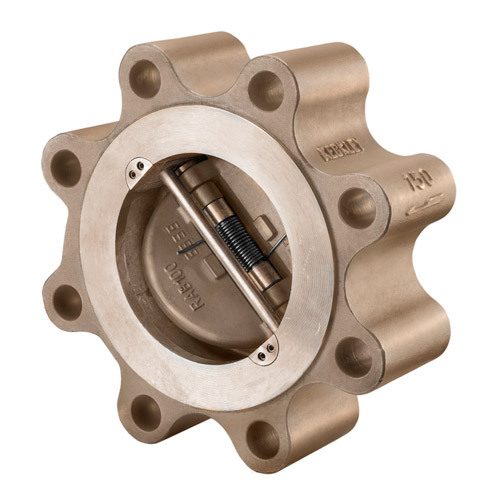 This design minimizes prospective leak paths through the valve body making it a preferable option for highly toxic, corrosive, or hazardous gas chemical processing applications. Keckley wafer lug body double disc check valves are also suitable for liquid, natural gas, steam service, and vacuum service applications. Keckley offers a retainerless wafer lug body design in bronze, carbon steel, stainless steel, and other specially cast alloys. 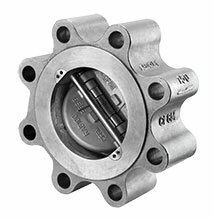 Keckley wafer lug body double disc check valves are used in both horizontal and vertical (upward) flow applications. For horizontal flow applications, the shaft should be vertically oriented to the pipeline. For vertical (upward) applications, the shaft should be perpendicular to the piping.